Just to be clear, while there is certainly a big difference between a “professional” underwater photographer and the casual shooter, both have a common desire to capture images of the incredibly diverse and colorful underwater environment. Some may be rewarded monetarily, while others get their reward from the memories the photos bring. But then let’s not forget all those divers without cameras who just want to see cool stuff and “capture” great images with their eyes! 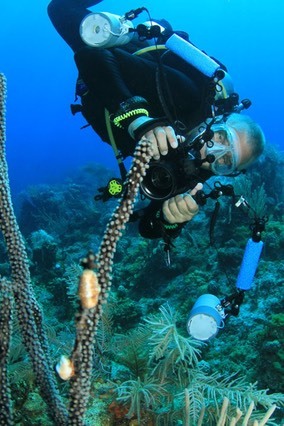 As a professional dive expedition leader for over 19 years, I have had the opportunity to see many examples of divers enjoying and sharing the world under the waves together….peacefully. But as you might imagine, there can sometimes also be a bit of inadvertent tension between those with and without cameras, and sometimes there are even hard feelings and frustration among photographers themselves when vying to capture the “money shot" of the same really cool subject! Based on conversations with many divers, observations, and my own experiences in these situations, I am more and more convinced that the source of this tension stems from a lack of understanding or just plain ignoring underwater photo etiquette and basic courtesy. In other words, some divers simply don’t understand or care how their actions and behavior can impact the behavior of marine life and the process of taking an underwater photograph. 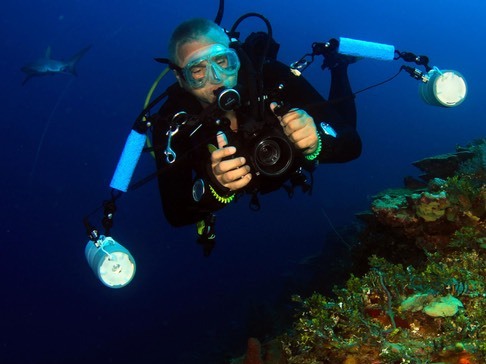 Whether you are holding a camera or not, all divers should have some degree of awareness and employ a little common sense. In my many years as a diver, I know that I have been both guilty of, as well as a victim of some of these situations. This article is not really intended to set forth any hard fast rules, but rather to create awareness and perhaps foster a more open discussion and understanding among divers. Hopefully, through dialog and a little bit of self evaluation, we can minimize capturing underwater images as a source of frustration and bad feelings before, during, and after a dive. After all, we’re supposed to be dive “buddies” not adversaries! So let’s explore the subject from several perspectives and maybe offer up some food for thought for divers both with and without cameras. Coral reefs are extremely fragile! 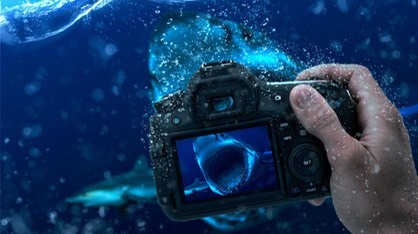 So make sure that you have your buoyancy skills under control before you decide to dive with a camera (or even just get in close for a good look). The need to develop good buoyancy skills has been drilled into our heads right from the beginning of our foray into the world of diving. 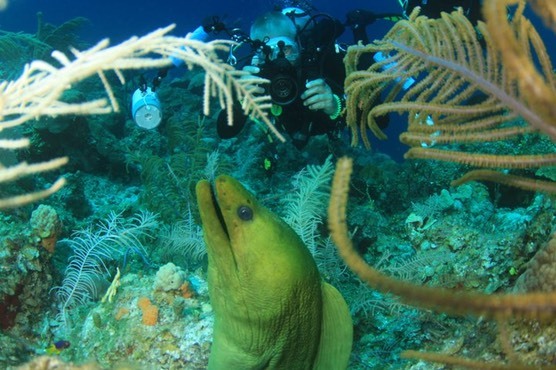 Even with a camera in your hands, remember, you are always a diver first! So before you pick up a camera with the intention of getting in close to get that great shot, make sure that you have mastery over your buoyancy and finning technique. That means getting properly weighted, learning to kick in tight places, and practicing, because good buoyancy it’s not something that comes from reading a dive manual or watching a video! For those of us that love and respect the marine environment, it is heartbreaking to see a well-intended photographer crash into the reef while trying to get into position for the shot. But often it’s even worse after they take their shot and are trying to move away while kicking and thrashing the coral in the process. The loser is always the coral, and if you happen to be the next person that was planning to get into position for the same shot…you might as well forget it! Never mind the poor visibility due to all the sand & particulates that have been kicked up by the previous diver, the subject has long since disappeared in fear for its life when the other person swam right over it while awkwardly trying to move away. Something to think about before and after you take your shot….but this also applies to those without cameras that are trying to get a good look! I have often witnessed this amazing underwater phenomenon. A strobe fires somewhere on the reef and every diver around (with or without a camera) descends upon the source of the flash like a moth to a flame! Much like a powerful magnet, no one seems to be able to resists it’s force and is drawn towards it. In fear of missing something really interesting, everyone wants to see what that person thought was worthy of a photo. That’s when the chaos begins! It often goes something like this, you find an interesting fish or behavior and you take a shot. Before you know it, there are divers everywhere wanting to get a good look or anxious to take a shot. The result is usually bumps, kicks, bubbles everywhere, fingers, lights & cameras pointing….and a poor critter that has now long since disappeared in mortal fear so that no one ends up with a decent shot or even a good look. And even if you manage to squeeze off a photo or two, there are usually people, lights, and cameras in the frame along with the backside side of a very freighted fish looking for cover. No matter whether you are the first or last diver to arrive, when this happens usually no one is happy, especially the fish! So think about your approach. If someone is taking a shot or even just looking at something interesting, give them some space. Remain at a respectable distance and wait for your turn so that everyone gets a chance to see it. Chances are that if you just charge in you will drive the subject away and not only ruin the shot for the person that was there first, but it will likely cheat everyone else from an opportunity to enjoy something really cool. The flip side of this is to not be an inconsiderate “hogfish" yourself and “camp out” on the subject so that no one else can enjoy it. Just take a few shots or get a good look and then carefully move out of the way so that others can enjoy the great find. If you want more pics or another look, simply move to the back of the line for another turn. Kind of like a rotation. And if the subject is of particular interest to you, then wait until everyone has had their chance and then you can have your private photo or video shoot. As discussed above, after your turn, be thoughtful about how you make your exit to avoid chasing the subject away or destroying the visibility with careless fin kicks. And if you’re waiting for your turn and the location is a little tight or affected by current or surge, make sure that you allow the previous diver enough room to make a careful exit and don’t force them to swim over the subject because you have blocked the exit path, otherwise you become part of the problem yourself! Hmmm….that kind of depends, but is definately something we all need to think about if we haven’t already. Like many of us undewater photographers, I know that I have a tendency to linger on a great subject and often return to it after everyone has had an appropriate chance to see it and get their shots. But what impact does that have on my dive buddy, the dive group that I am with, or the dive leader that I’m supposed to be following? Communicate with your dive buddy so they understand that you may become preoccupied and may not be aware of their situation as a good buddy should! Make a plan in advance so that they can also keep both you and the group in site so that no one gets separated and potentially lost. That also means that when your buddy signals that it’s time to go, it’s really time to go! Communicate with the dive leader if you and your buddy plan to go off on your own to get some shots so that you don’t compromise the dive for the entire group because you and your buddy have suddenly disappeared and now a search must initiated after everone else is brought back to the boat early. But even if you do let them know, your navigation are skills are up to speed…..right? 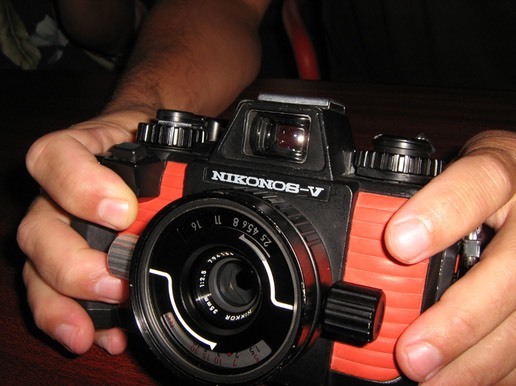 This article wouldn’t be complete without a list, so here are some situations and things to consider no matter whether you carry a camera or not. All of us could probably add to it from our own experience and frustrations, so while hardly conclusive, it might serve as a catalyst for thought and hopefully a little introspective. While it would be nice to think we would all have the opportunity to get a good look at everything on every dive, reality teaches us that’s not quite the way it actually works out! Sometimes you have the chance get the great shot, and sometime it will be the other guy. But the point is that everyone deserves the chance! And in order to have a chance we all need to work towards a common purpose and understanding that the oceans are to be respected and shared. Most of this seems like common sense, but we all know how scarce common sense can be at times! 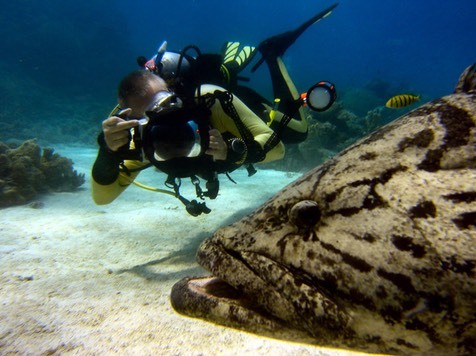 It’s really about being situationally aware and considerate of the environment as well as of other divers. After all, you don’t want to end up getting voted off the island or the victim of a mutiny on the dive boat! So use your head and treat others the way you would like to be treated….we all just want a chance to share and appreciate all that our amazing oceans have to offer!